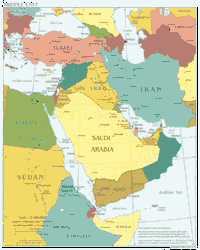 Most people–especially in the West–know very little about the Middle East and the people that live there. This lack of knowledge hurts our ability to understand, and engage in intelligent discussion about, current events. For example, frighteningly few know the difference between Sunni and Shia Muslims, and most think the words “Arab” and “Muslim” are pretty much interchangeable. They aren’t. So here’s a very brief primer aimed at raising the level of knowledge about the region to an absolute minimum. Arabs are part of an ethnic group, not a religion. Arabs were around long before Islam, and there have been (and still are) Arab Christians and Arab Jews. In general, you’re an Arab if you 1) are of Arab descent (blood), or 2) speak the main Arab language (Arabic). Not all Arabs are Muslim. There are significant populations of Arab Christians throughout the world, including in Lebanon, Syria, Jordan, Northern Africa and Palestine/Israel. Islam is a religion. A Muslim (roughly pronounced MOOSE-lihm) is someone who follows the religion. So you wouldn’t say someone follows Muslim or is an Islam, just as you wouldn’t say someone follows Christian or is a Christianity. Arabs are Semites. We’ve all heard the term anti-Semitism being used — often to describe Arabs. While antisemitism does specifically indicate hatred for Jews, the word “Semite” comes from the Bible and referred originally to anyone who spoke one of the Semitic Languages. According to the Bible, Jews and Arabs are related [Genesis 25]. Jews descended from Abraham‘s son Isaac, and Arabs descended from Abraham’s son Ishmael. So not only are both groups Semitic, but they’re also family.